Description: A North British Railway line from Glasgow Queen St.(Low Level) to Edinburgh (Waverley) ran roughly west to east through Coatbridge, Airdrie and Bathgate. Near Glasgow two branches came off this line southwards, at Blairhill and Shettleston, to merge north of Bothwell. The line continued for 3 miles to a terminus at Hamilton, a curious, triangular structure with platforms on two sides and road access on the third side. The main platform had a loop to allow locomotives to run round. History: The original purpose of the line,built by the Glasgow, Bothwell, Hamilton and Coatbridge between 1878 and 1888, was to service numerous coal mines in the district. With the passage of time several intermediate stations were closed but there were regular passenger services, via Mount Vernon, Uddingston East and West as far as Bothwell until 1952. This village became the terminus when the line to Hamilton had to be abandoned because of the poor condition of Craighead Viaduct, a splendid iron structure on high, sandstone pillars crossing the gorge of the River Clyde.The branch, including the one intermediate station at Burnbank (originally called Greenfield), closed completely in 1955. Memory: As a schoolboy I travelled daily between Bothwell and Hamilton in LNER days from 1943 to 1949. The main passenger traffic then from Hamilton was to Glasgow, the normal motive power being a V1 2-6-2 or N2 0-6-2 tank, with the occasional J36 or J39 0-6-0, all from Parkhead shed. A kindly driver would take a couple of schoolkids on the footplate and have a laugh at our expense as we had a go at the seemingly simple art of firing. Trains to Blairhill were infrequent, usually in the hands of a Kipps-based ex-NBR C15 tank. Occasionally, a Sentinel Steam Railcar was used. One train operated from time to time was the early Saturday afternoon train from Blairhill to Hamilton, which sometimes picked up a large crowd at Bothwell, heading to a football. match. An elderly, six wheeled coach was occasionally added and the whole thing packed to suffocation was definitely a challenge for the meagre power of the railcar. Way way back in the summer of 1966, when I was fourteen years old, my parents, brother and I were on holiday in north Devon, staying in a caravan at Woolcacombe. Every day in dad's car, on our way to explore places like Ilfracombe, Lynton and Coombe Martin, we would pass the station at Mortehoe & Woolacombe, some distance from both places. By then I was already a diehard railway enthusiast, unlike my brother and I begged mum and dad to up my pocket money so I could afford a ride on the line. They eventually relented but getting on the train at Mortehoe was not good enough, I wanted to do the whole line from Ilfracombe and one day, dad drove me to Ilfracombe station and then he, mum and my brother went on to Barnstaple in the car to meet me there when I got off the train. The d.m.u. was well-filled as it left Ilfracombe and I had managed to secure a seat behind the driver who didn't wind down the blinds so I could watch the line ahead. As we climbed up to Mortehoe & Woolacombe, more people joined the train and there was a healthy crowd of country townsfolk in their summer clothes waiting at the next station at Braunton, so much so that I found it hard to believe the line was a candidate for closure. At Braunton, an elderly lady took the seat next to me and we fell into conversation as the train started to wind down the Taw valley. I mentioned that the line was down for closure and the lady replied that she was horrified, she had been using the train to go shopping in Barnstaple for 40 years, so right back to the 1920s, and "didn't trust" buses. Why, she didn't trust buses she never made clear but her parting words as she got off the train at Barnstaple Town, the one time connection to the Lynton & Barnstaple narrow gauge line, was a defiant "they'll close this line over my dead body." The train then wound on over the twisting the bridge across the Taw and rattled over the points of the recently closed line to Bideford and Torrington into Barnstaple Junction (now the limit of the entire railway network in north Devon) and where my parents and brother waited patiently to meet me. Four years later, the line was indeed closed and I still occasionally wonder what happened to that lady who was so determined not to have to use the bus replacement. Closing the line may have helped with the then BR regime's bank balance but it destroyed this lady's way of life - and the lives of many others like her, no doubt. 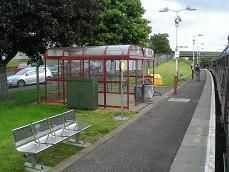 Trivia: The now continues to Airdrie and Glasgow and was reopened in 2010. Description: A short branch off the main Bedford to Brighton Thameslink line. 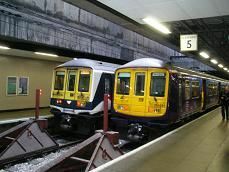 History: The line closed in March 2009 due to the expansion of the ThamesLink platform at Farringdon. Description: The branch line went due east from Glasgow to the town of Airdrie's Drumgelloch station, but since 2010 now goes all the way to Edinburgh via Bathgate. Description: This branch line which reopened to passenger traffic in 1989, went in a north easterly direction from Oxford through to Bicester just south of the Chiltern Mainline from Marylebone to Birmingham. History: Originally this branch line was part of the Varsity Line which ran from Oxford to Cambridge via Bletchley and Bedford. This section was opened in 1851 and closed to passenger traffic in 1967 as part of the Beeching cuts. 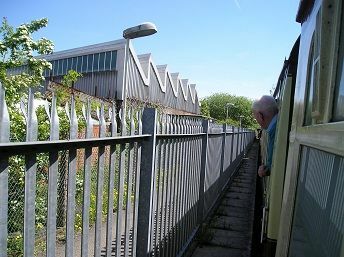 However the line was reopened to passenger traffic in 1989. The new curve from Bicester Village (renamed from Bicester Town) to the Chiltern mainline opened to pasenger trains in October 2015, when London to Oxfrod Parkway services began running, thus ending its status as a branch line. 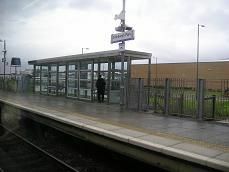 This branch in the south of Derby ran from Peartree on the Derby to Birmingham main line to Sinfin Central along the former line to Castle Donnington. The branch was opened in October 1976 as a way of extending Matlock trains beyond Derby to serve the large Rolls Royce works at Sinfin. 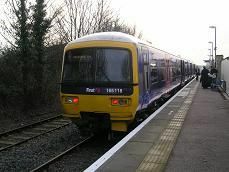 However passenger numbers were not as high as hoped for and the branch was closed in 1993. It is still open for a weekly aviation fuel train for the plant at Sinfin though the stations are covered in trees and bushes.